DSSSB Recruitment 2018 - Apply Online for 4366 Primary Teacher Posts in Municipal Corporation of Delhi. 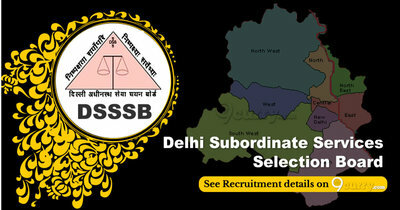 Online Applications are invited by DSSSB - Delhi Subordinate Services Selection Board from 02 Jul 2018 to 30 Jul 2018 for 4366 vacancies. DSSSB Primary Teacher Result 2019: DSSSB - Delhi Subordinate Services Selection Board has announced the Result for the exam . DSSSB Primary Teacher Answer Key 2018: DSSSB - Delhi Subordinate Services Selection Board has issued the Answer Key on 14 Dec 2018 for the exam. Answer Key can be accessed from the link given below. DSSSB Primary Teacher Admit Card 2018: DSSSB - Delhi Subordinate Services Selection Board has issued the Admit Card on 18 Oct 2018 for Primary Teacher Exam 2018 which is scheduled to be held on 28 Oct 2018. DSSSB Primary Teacher Admit Card 2018: DSSSB - Delhi Subordinate Services Selection Board has issued the Admit Card on 04 Oct 2018 for DSSSB Primary Teacher Exam 2018 which is scheduled to be held on 13 Oct 2018. Age Relaxable as per instructions/ orders issued by Govt. of India from time to time. (ii) Two year’s Diploma/ Certificate Course/ in Elementary Teacher Education Course/ Junior Basic Training or equivalent or bachelor of elementary education from a recognized institution. 5. PH-474 (VH-381, OH- 93). The selection will be on the basis of written test. Eligible candidates may apply online at DSSSB's website (direct link is given below) from 02 Jul 2018 to 30 Jul 2018. Candidates log on to https://dsssbonline.nic.in/.